What a roaring success! The Allergy+FreeFrom Show 2012, held this year in the new, larger location of the West Hall at Olympia, London, had over 180 stall holders, and saw over 13,000 visitors through its doors from 10am Friday to 4pm Sunday – in fact on Saturday F2F Events, the organisers, were on the brink of closing the doors at one point as overcrowding risked ruining the visitors’ experience! A larger venue next year, we suggest? With more foods from all around the world, and a greater variety of breads, ice creams, cakes, curries, pies, ready meals, raw foods, chocolates, mixes and ‘milk’ products than ever before, the Allergy+FreeFrom Show, already a highlight in the allergy year, is becoming a must-visit for anyone with allergies and intolerances. More specifically, the show offers information on allergy management for those with autoimmune diseases like coeliac and Crohn’s, chemical sensitivities, eczema, asthma, hay fever, allergies, food and other intolerances, and respiratory and skins conditions. However….. While the show was a huge success and greatly enjoyed by the vast majority, some of the more acutely allergic visitors were more than unhappy about the number of ‘allergic’ foods on offer, the general lack of allergen control and the significant risk of allergen contamination on many stands. Organisers of any ‘allergy’ show have a huge problem in this area. Not only are there are an enormously wide range of foods to which allergic visitors could react but what is a major allergen for one visitor (nuts) can be a staple food providing significant nutrition for another (a coeliac) – and vice versa. So, excluding all possible allergens could mean that they could end up with very few foods that could be exhibited at all while many visitors would not get a chance to find foods which would be excellent for them because they would be a potential allergen for another visitor. Allergen control, though is a different matter. The organisers are acutely aware of the potential contamination risk and are anxious to alert stand holders to these risks and to the importance of allergen control on their own stands. But despite their best efforts, the responsibility for ensuring that the food on offer is ‘safe’, especially if it is ‘freefrom’ food, has to lie with the exhibitor, and many stands left a great deal to be desired in this area. There has been much comment in the blogosphere on this – see What Allergy? And YesNoBananas to name just two – and it is to be hoped that exhibitors will read and take serious note. Even if they are unable to entirely control the contamination risk (and this will always be great with that number of people milling around) they need to provide far, far more detailed, clear and obvious information about all the foods they are offering. The final responsibility for avoiding a food to which they are allergic must always lie with the allergic person, but in order to shoulder that responsibility they must be given the information about the food that they need to make an ’informed’ decision. 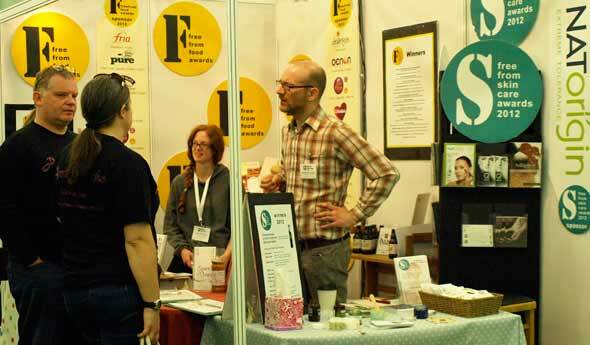 Foods Matter were there this year as the FreeFrom Awards, and those of you who have been paying attention will know that as well as the FreeFrom Food Awards (FFFA), now in their very successful fifth year, we also run the FreeFrom Skincare Awards (FFSA), for which we had the presentation on the Friday afternoon. 2012 being its first year, the FFSA had just three categories: Body Care and Hair Care Products, Make up, and Face Care Products. The overall winner was Qsilica Remove Make Up and Grime Cleansing Gel, and we sampled many of the winning and shortlisted products on our stall, sending excited visitors beetling round to the relevant stand for more pots of Gentle Green’s Ecz-tend Soothing Cream, Eden Fresh Therapies Natural Nail Polish Remover and Salcura’s DermaSpray Natural Skin Nourishment among others. It was wonderful to see so many more skin and hair product manufacturers this year, and to offer support to companies in this area through the awards. For more information on the FFSA and the winners, have a look on the SkinsMatter website. FreeFrom Food Awards – fifth amazing year! The FreeFrom Awards were also showcasing the winners of the FFFA, and offering samples of some of the winning products, which were enthusiastically gobbled up. Many of the winners also had stalls at the show, including Anila’s Authentic Sauces, Lavida Foods, Drossa, Sauces of Choice, Fria, inSpiral, Sweetcheeks, Booja-Booja, The Cake Crusader, and the overall FFFA winner of the FAIR trophy, Vegusto, who were serving little cubes of their award winning cheese right by the entrance. Occupying a large corner stand, we had a good flow of visitors, some of whom headed for Leith’s café, who served some delicious allergen-free hot meals including Clive’s Pies, free from gluten, wheat and dairy, and some of whom attended one of many cooking seminars on the Sainsbury’s FreeFrom stand. Other supermarkets Tesco, Asda, Marks & Spencer and Ocado were there in force, showing their freefrom ranges to best effect, and Ocado displayed the large range of branded goods now available from its online shopping service. As well as food and skin products, there was BAM’s bamboo clothing range and bedding companies Espère Healthcare and Cotton Comfort, with EcoEgg and Ecover to ensure the laundry would not irritate. London hospitals Homerton, Barts & The London Allergy Centre, Royal Free and St Mary’s all had stalls, showing a reassuring NHS support to allergy sufferers. There were stalls for allergy-friendly flooring (Forbo), cooking (Thermomix and Vitamix), foot care, massage, and stinging insect solutions. It wasn’t all about products though, as plenty of free workshops ran throughout the three-day event. The Anaphylaxis Campaign ran a workshop on living independently with food allergies and travelling abroad. Coeliac UK offered a Q & A with their deputy head of diet and health, and information on both Coeliac Awareness Week (that ran 14th-20th May) and the Gluten Free Challenge. Action Against Allergy ran a workshop on managing children’s allergies at home and at school, including a talk by a leading specialist on the best approaches to allergy management and the latest information about treatments; and parents went away afterwards with a pack of useful information. Asthma UK held a 90 minute workshop delivering four key messages to help people manage their asthma more effectively, aimed at not just asthma sufferers but also their families, friends and carers. There were also 45 minute seminars in the Sealy Theatre, with talks on, amongst other topics, surviving the pollen season, eating well on a gluten free diet, and irritable bowel syndrome, all built around keynote speakers such as Dr Runa Ali on ‘diagnosing allergy’, Dr Adam Fox updating on ‘what is new in food allergy’, and Dr Robert Boyle, a paediatric allergy consultant, on ‘avoiding airborne allergens’. From former Wham! singer Janey Lee Grace’s presentation of the FFSA winners last thing on Friday which added a touch of glamour to the day, to Kathryn Miller of Coeliac UK closing the Sunday sessions with a talk on the crucial issues of gluten free labelling, there was certainly something for everyone. There were also stalls for the kids, with Freddie the Mouse educating youngsters at school about anaphylaxis and severe allergies by way of charming storybooks, which complemented the Naturally Cool Kids clothing range, and Foods You Can, a website with information on places to eat, holidays and travel, offers and vouchers and info for mothers, babies and toddlers who are free from. inSpiral even had raw, dairy free ice creams for sale, in gluten free cones! Stalls with allergy testing, air and water purifying machines, medical devices and cleaning products all combined to help put the allergic consumer in back control of their own lives. Living with an allergy can make some people feel helpless and alone, and the Allergy Show is a fantastic resource for those who can make it, to learn and get to grips with their environment. For a video of what was going on click here. For those of you who live too far north – fear not! For the first time ever, The Allergy+FreeFrom Show will also take place in Liverpool this year, running as the Allergy+FreeFrom Show North over the weekend of the 27th/28th October at the BT Convention Centre. Tickets and more information available here.